The Roman Amphitheater of Alexandria in the Kom al-Dikka Complex, Alexandria. The Roman Amphitheatre of Alexandria was discovered by mere coincidence in the year 1960. When the workers went to remove a pile of dust and sand in 1960 to clear the land for the construction of a governmental building, they found some solid iron columns, indicating that something may be buried underneath. Immediately afterward, the excavation work began in the location of Kom El Dekka and it was carried out by the Greco Roman Museum and the Polish Excavation Mission in Egypt sponsored by the University of Warsaw. Shortly afterward, the excavation revealed one of the most important discoveries in Egypt in the 20th century. The Usage of the Roman Amphitheatre in Different Periods of Time. The Roman Amphitheatre stayed in service and was used to host different artistic events like musical concerts and different sorts of events up till the 7th century. This fact was proven due to the architectural elements present in the theatre which show that it was used for three different periods; the Roman, the Byzantine, and the Early Islamic era. The amphitheater was used for several purposes during its long history and passing through different periods of time. It was used as an odeum where musical shows were performed during the Roman period. The theatre, at the time, had all the elements to host perfect performance like the dome that once stood over the stage and the section of the orchestra. On the other hand, in the Byzantine era, it was used as a conference hall where important meetings, like public assemblies and governmental summits, were once held. 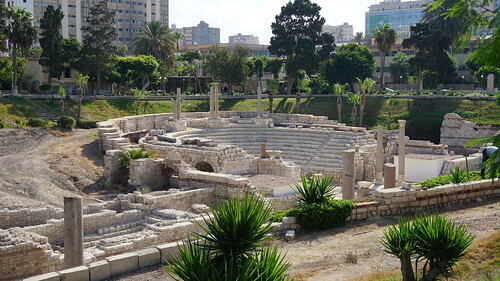 The Roman Amphitheatre was most likely neglected during the early Islamic period and onwards until it was discovered during the middle of the 20th century to become one of the marvelous historical sites of the city of Alexandria.